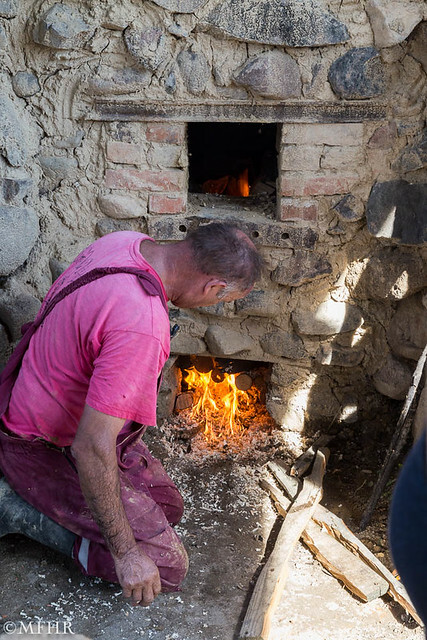 In August 2015, we were given the opportunity to travel to Meziad, a lime-burning village in Romania, and participate in the process of loading and firing a traditional kiln or ‘cuptor’ (Fig. 1 and 2), slaking the quicklime produced, and experimenting with the lime products for harling, limewashing and decorative painting (Fig. 3). The exchange visit was organised by ARCH in Scotland and hosted by Satul Verdi, the partner organisation in Romania. The trip was an Erasmus + funded Staff Education Project. As building surveyors with The National Trust for Scotland and Historic Scotland, organisations which collectively care for a large number of historic and traditionally constructed buildings, the main aim of the visit, apart from taking in the beautiful scenery and enjoying the local culture, was to see first-hand the production of lime, within a system that utilises local skills, labour and materials to produce a high quality and sustainable material, perfectly suited for the repair and maintenance of local vernacular buildings. Lime burning in Romania is part of an unbroken rural tradition which is at risk. The tradition of kiln building and lime burning is maintained by an increasingly older generation, with no apparent successors from younger generations appearing willing or trained to take over and secure its future. As a consequence, the production of lime in Meziad, a process which may well have continued almost unchanged since Roman times, is at risk of being lost within a few years. A further consequence may well be that the skills needed to use lime in the maintenance and repair of traditional buildings will also be lost. The loss of this knowledge and the practical skills is likely to have a negative impact, potentially resulting in significant harm being caused to buildings on a technical and cultural level, and possibly the eventual loss of buildings due to the effects of inappropriate repairs and maintenance (Fig. 4 ). This disheartening scenario echoes that which occurred in Scotland in the post-war years, whereby the skills required to maintain many vernacular buildings died out as populations in rural areas decreased or were displaced, and the introduction of modern building materials and techniques made the traditional buildings and skills seem obsolete. With no appreciation or protection, the skills and products which had been used to maintain these ‘ordinary’ buildings for centuries, and often the very buildings themselves, were abandoned or the buildings were ‘restored’ or altered beyond recognition using modern materials. The result was that within a generation or two the techniques required to maintain traditional buildings appropriately were forgotten. Only much later was there a realisation that many once commonplace vernacular buildings, such as barns, thatched cottages and agricultural or small scale industrial buildings, were and are of national significance and worthy of preservation. By the time these modest building types were appreciated, many had been lost and the understanding of the materials and skills required to sustain them was also lost (Fig 5). This loss of knowledge and skills has resulted in many, many years of research, trial and error and experiments and a great deal of financial investment in an attempt to rediscover traditional skills and processes – skills which were at one point so commonly understood that they were barely even documented. This process of rediscovery of traditional skills is still going on in most part of the UK and Western Europe. Sadly, some building types only survive in open air museums rather than being kept in a sustainable use (Fig 6). Although there was no structured programme of local site visits to properties in the village during the stay in Meziad (due to restrictions on time and other priorities), some visits to local vernacular buildings would have been very beneficial to gain a fuller understanding of lime use in maintaining traditional buildings in Romania. Anecdotal evidence suggests that the use of cement is becoming widespread for maintaining/improving houses in the areas visited. Indeed we witnessed several examples of cement being prepared and used on houses within the village. The risk is that cement (particularly modern varieties) is very poorly suited for use alongside unfired/low fired bricks, clay, timber, wattle and daub and earth plasters/mortars. It is astonishing that cement is being used in Meziad, despite is technical incompatibility with the local materials and despite there being a high quality, locally produced and cheaper alternative readily available. We were informed that for an outlay of around £250 enough quicklime was produced in one ‘burn’ to make around 10 tonnes of high quality lime putty. This can be sold at market for around £2500 – which represents a very healthy profit margin. So long as there is demand, lime burning in this way appears to make good financial sense. It would be very interesting to see a cost comparison between equivalent quantities of locally produced lime and manufactured cement to understand whether the increasing use of cement is based on cost, convenience, or simply a belief that it is a ‘better’ product. This situation again mirrors that in Scotland, where local lime production and use was replaced by cement for the repair and maintenance of traditional buildings. The use of cement was so poorly understood, and the loss of knowledge of lime mortars so widespread, that cement mortars were even specified and supported by heritage organisations for repair of historic monuments. The National Trust for Scotland and Historic Scotland have both been complicit in this practice in the past, albeit with good intentions. The use of cement for repair of traditional buildings in many cases led to the accelerated decay and sometimes extensive and irreparable damage to weaker substrates such as stone, brick and earth. The consequences of this are evident throughout Scotland, on large and small, grand and modest buildings, where stone decay and dampness is now common. Only after the ‘lime revival’ of the mid 1980s was there a change of approach amongst building professionals. Once again the skills and understanding needed to use lime successfully had been lost, and has had to be re-learnt. For those not closely involved in building conservation, and even for those who are appropriately trained, the situation caused by this historic abandonment of traditional skills in the UK has led to much confusion, disputes and many expensive mistakes being made, as well as a great deal of damage to our built heritage. Nowadays, specialist ‘Lime Consultants’ enjoy a brisk trade, as its use is considered (by many) to be ‘specialist’ and complicated. Today, while there is a much greater appreciation of the use and benefits of lime in Scotland, there remains great difficulty in ensuring contractors have the correct levels of skill and understanding. As a result there is a growing movement towards the use of pre-mixed mortars. Whilst these offer consistent results and convenience of use, they remove the need for the individual craftsperson to have a real understanding or feel for the constituent parts of the mix. Buildings, materials, climates and local conditions vary widely even within a relatively small country as Scotland, and the local materials, used with the benefit of generations of local experience, are often the best to use for repair and maintenance. An off-the-shelf and highly processed product is unlikely to offer the best match technically or aesthetically. Fig. 7 Thatched buildings such as this field barn may soon be at risk. We feel that there is an opportunity for Romania to avoid the painful lessons from Scotland, where for several generations, until the late 20th century, much of its vernacular architecture and the traditional skills required to maintain it were lost. It seems that in Romania there are large numbers of relatively untouched vernacular buildings, still in their intended use and maintained because they are useful – not out of sentimentality or appreciation of their ‘rarity’. There is enough of a skills base and understanding of the techniques required to maintain them and ensure their long-term future. However, what is not clear is whether these buildings and traditions are valued enough to ensure their preservation either locally or as a national prerogative. Anecdotal evidence suggests that while higher status buildings are protected by law, no statutory protection seems to be in place for ‘ordinary’ vernacular buildings or their settings. These places, which are so characteristic of rural Romania, are at risk, despite their apparent ubiquity (Fig. 7). 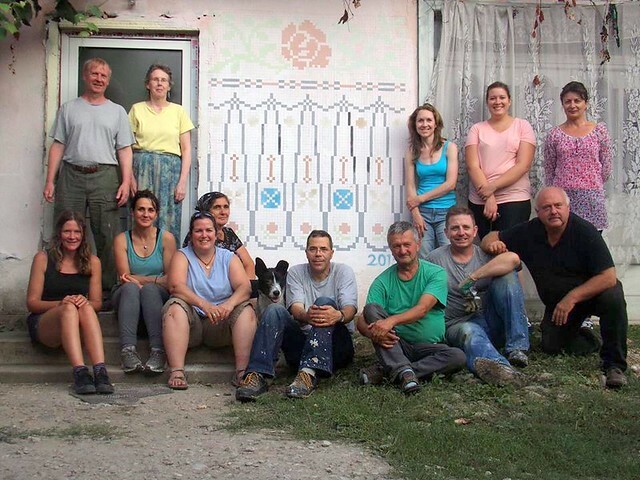 Ironically, the fact that we were able to visit Romania on a funded training programme, supported by the European Union, is undeniably linked to the process of free movement of people and products that has contributed to the loss of traditional skills and a traditional way of life. As younger generations take advantage of the benefits being part of the EU, moving within Romania and abroad to take up jobs or further education, and a life of self-sufficiency is replaced by the pervasive consumer culture of Western Europe, so much tangible and intangible heritage that has great value for current and future generations is at risk of being forgotten. 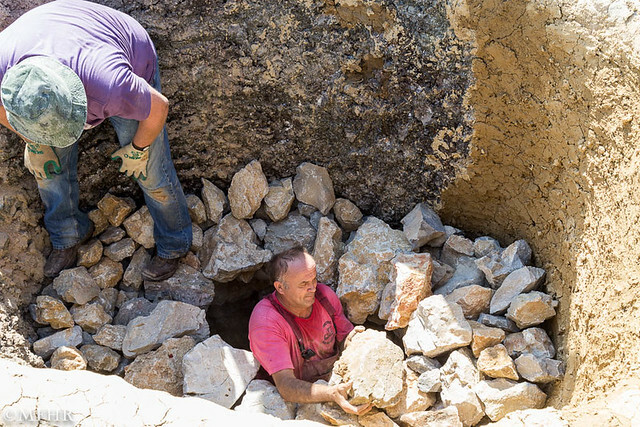 This process of ‘improvement’ wiping away tradition was visibly evident in Meziad, where the installation of new sewage and water pipes had partially destroyed the lime kiln which lay in its way. Amongst the building works, plastic pipes and the lorries which occasionally rumbled past nearby, it was poignant to sit with our Romanian companions, one of whom, Delu, was 80 years old and still employed to watch the ancient cuptor as it burnt throughout the night, loading it with wood to maintain the fire (Fig 8). The lime kiln which we loaded and fired is the only one remaining in the village, whilst along the road which takes tourists up to the nearby limestone caves, there are a series of horseshoe shaped grassy mounds – remnants of dozens of ancient kilns, now abandoned to nature and already archaeology (Fig 9). It is easy to become wistful and nostalgic in the Romanian countryside, as it is not so dissimilar from our own before political and economic changes and industrialisation re-shaped the landscape. But the retention of these skills and traditions (of which lime burning is just one) is not about nostalgia or romantic notions. It is as essential for the protection of traditional buildings as the programme of statutory protection that is already in place for higher status buildings. Rather than using modern materials and techniques to maintain these places, perhaps encouraging the continued use of locally produced traditional materials could help preserve the architecture and sustain a local industry. This is a lesson we need to develop further in Scotland, particularly as surveyors sourcing and specifying lime mortars. Having rediscovered the benefits of lime for traditional buildings, the use of processed, manufactured lime products is beginning to erode the skills available to prepare lime mortars on site in the traditional way, and we are still a long way off from sourcing locally produced lime, despite having a long tradition of doing so. Jessica Hunnisett Snow is a Senior Technical Officer at Historic Scotland. William Napier is a Chartered Building Surveyor, accredited in Building Conservation, at the National Trust for Scotland. .